The Moon Light Mesa trail is located in the Gunnison Gorge National Conservation and Wilderness Area near Delta, Colorado. The trail parallels the Chukar Road for 5 miles, crossing numerous hills and domes, between the Elephant Skin Road and the Peach Valley Road. Several of the hills on the west end of the trail, where it borders the Open Riding Area near the campground, are too steep for mountain bikes and suitable only for hiking and dirt bikes. This post begins at the staging area on the Elephant Skin Road. The easiest route there is to take the Falcon Road east out of Olathe to the Peach Valley Campground area. Continue on the Peach Valley Road about a quarter mile and turn right onto the Chukar Road. Follow the Chukar Road for about 3.5 miles and turn right onto the Elephant Skin Road where you will shortly arrive at the staging area. The Red Rocks/Nighthorse trail departs from the southeast corner of the staging area and directly across the road to the west you can pick up a short spur trail that runs over to the Slanty Bridge and Moon Light Mesa trails. The trail splits about a hundred yards or so from the trailhead with the Moon Light Mesa trail following the right fork. The trail is a lot of fun as it works its way westward along the broken ridge. Just under the half mile point the Mystery Ditch trail branches off on the right where it blasts down a shallow arroyo for about 3/4 of a mile and reconnects with the Moon Light Mesa trail. If you have never taken that trail before you might consider it as an alternate route at least once. You are sure not to be disappointed. As the trail continues it comes to a hill where you can see how much of the rest of it is laid out. At this point the trail makes a big dip that is followed by a moderately steep climb. A look at the trails elevation profile reveals the general downhill change in elevation when traveling in this direction. The steepest hills that are tough for mountain bikers come up after the 3.5 mile point. The trail leaves the ridge at a private property boundary and heads northward across the valley. Around the 1.2 mile point it is met again by the Mystery Ditch trail. Shortly after that it crosses the Chukar Road and heads up a small drainage. Near the 1.6 mile point Moon Light Mesa makes a turn to the left where the Horse trail begins. 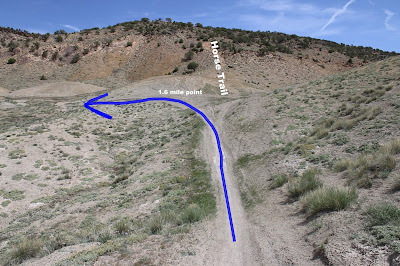 The Horse trail extends for about 3/4 of a mile from here up to the Chukar Road. The Moon Light Mesa trail takes a side valley that brings it out on a road about a hundred yards from the Sunset Rocks trailhead. The Sunset Rocks trail continues on the opposite side of the road but the Moon Light Mesa trail follows the road to the left to get back out to the Chukar Road where it crosses to the other side before continuing on its way. 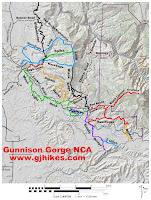 As the trail continues on the other side of the Chukar Road it comes to a fork that offers a choice of routes. Since we were on mountain bikes we opted for the right fork and went around the upcoming hill. The trail leaves the ridge once again and cuts across a corner of the Chukar Road. Just past the 3.2 mile point the Moon Light Mesa trail heads back up to the ridge passing a fork where the Peach Valley Loop branches off on the left. From the 3.2 mile point on there are lots of spurious trails that come up from the Open Riding Area that is on the west side of the ridge. At times it can be a bit harder deciding which route to follow. For the most part the Moon Light Mesa trail is well marked but when in doubt stay to the right and head towards the junction of the Chukar and Peach Valley Roads. At this end of the trail there are a couple of hills that are too steep for mountain bikes. They are even torture to walk up yet alone to try and push or carry a bike up. 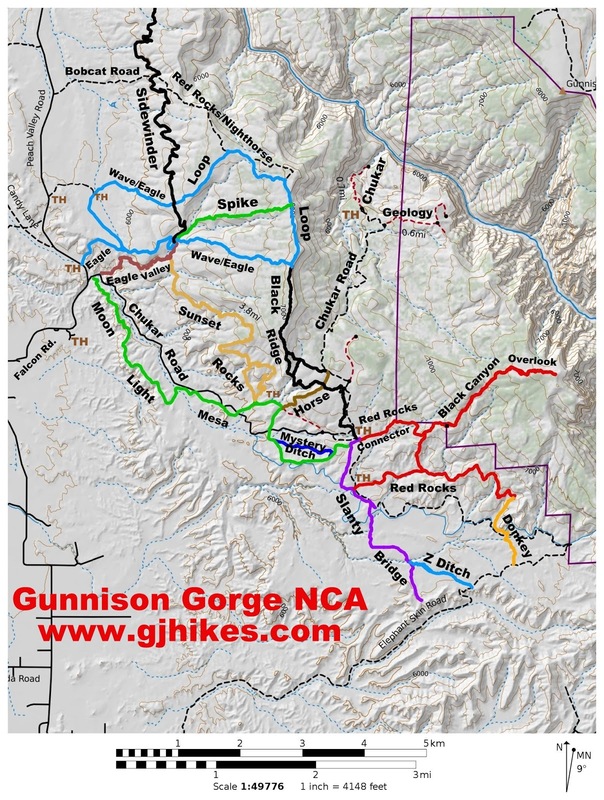 For this reason a mountain biker might want to either pick a route that finishes up by going through the open area or escape out to the Chukar Road. 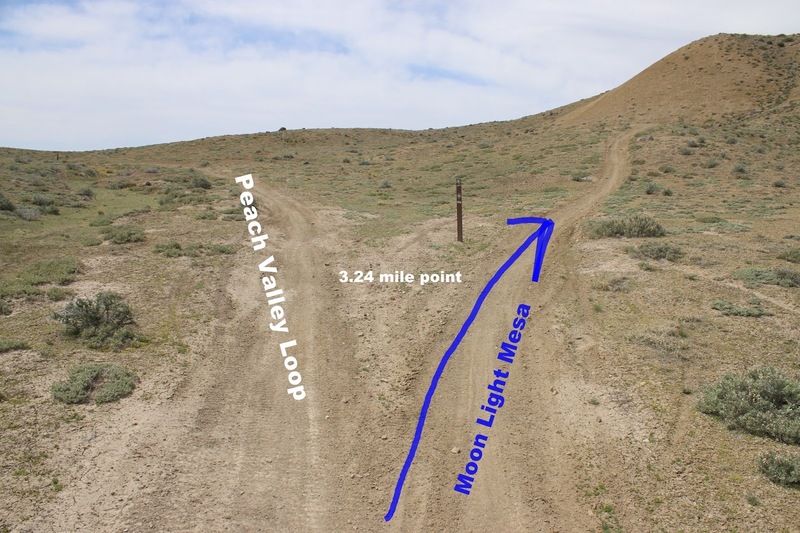 Moon Light Mesa comes to an end when it reaches a double track that is near the junction of the Peach Valley Road and the Chukar Road. Following the double track to the right leads to the Chukar Road and the Eagle Valley trailhead. Going to the left will take you to the Peach Valley Campground and staging area. Getting up a couple of the hills near the end of the trail was brutal with a mountain bike but it sure was fun riding down them afterwards. Maybe one of these days they will make alternate routes that go around them. We rode the Moon Light Mesa trail as part of a big loop that began at the Eagle Road trailhead where we took the Spike trail up to the Red Rocks/Nighthorse trail and then rode down Black Ridge to the Elephant Skin Road Staging Area. The map to the right should prove useful to come up with all sorts of other options. If you would like to see it for yourself then all you have to do is 'Take a hike'.